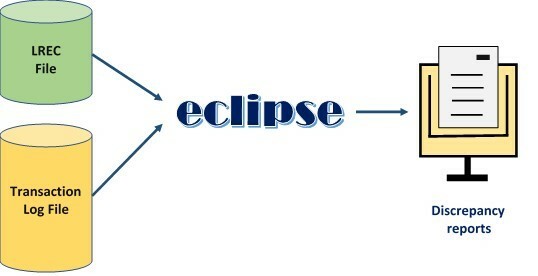 Eclipse is a product which compares transactions in a LINK LREC File against transactions in a Transaction Log File from an authorization system. Eclipse will output the following reports: LINK switched-in discrepancy report, LINK switched-out discrepancy report, Suspense report, Statistics report. The product is currently operational with ACI�s OpeN/2� product at Coventry Building Society using an LREC File format of ASCII Standard Data Format (Compressed) but can be configured by SPL for any authorisation system or LREC file format. LINK transactions from CBS ATMs are switched-in transactions and CBS transactions at LINK ATMs are switched-out transactions. Each file record is matched in sequence. Missing records are reported on the discrepancy report. A CBS transaction switched in from a LINK ATM would appear on the switched-in discrepancy report. A LINK transaction switched out from a CBS ATM would appear on the switched-out discrepancy report. A switched-in transaction which is on the Transaction Log File but not on the LREC File would appear on the switched-in discrepancy report as �Missing from LREC�. Records are also checked for minor field differences. Switched-in records which have at least one field which does not match are reported on the switched-in report. Switched-out records which have at least one field which does not match are reported on the switched-out report. Records near the end of a file which cannot be matched are held over in a suspense file until the next run when Eclipse will attempt to match them for a second time. Non-matched records will then be reported as missing. Eclipse also reports the number of records processed and details of matching success in a statistics report.